"Our condolences to Carolyn's daughters Ruth and Marie, as..."
Carolyn Ruth Lehman passed away peacefully at her home in Olympia, WA on March 21, 2019. 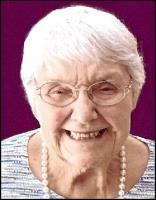 She loved her family, friends and being active in the First Presbyterian Church when she lived in Vancouver, WA. Carolyn is survived by her sons, Rick (Brenda) Lehman of Olympia and Ken Lehman of Spokane, WA; and daughters, Ruth Lehman of Olympia and Marie (Gary) Bricker of Kea’au, HI. A graveside service will be held Friday, April 12, 2019, 2:00 p.m., at the Fort Vancouver Barracks Post Cemetery on Fourth Plain in Vancouver.